Poultry farming is one of the most important aspect of farming for many reasons. It creates great business opportunity for Entrepreneurs, and provides employment for the job seeking citizens. This will help you make your decision as regards starting your own poultry farm. The Chicken and it's products are very rich source of protein, you and I need the proteins derived from chicken to maintain healthy living. It is generally believed that every child needs not less than an egg a day for their normal growth. While every adult needs like ten in a week; Poultry also provides meat for delicacies - no tribe or religion that forbids chicken meat. Everyone likes it, that's why poultry products sells very fast and in high demand. The Benefits of Poultry Farming are so numerous that this page may not contain it all. Apart from the chicken being used as food, Poultry Farming is equally profitable. A good poultry farmer earns above N20 million per annul depending on how big the farm is. All these benefits are open to you if you start your own poultry farm today! There are basically three different breeds of bird for poultry business. We have the Broilers, Cockerels, and Layers. The Broilers grows very faster and are ready for sale at 12 weeks from hatch. Cockerels grows slower and can take up to twenty four weeks before they are matured for marketing. But, Cockerels are reliable in terms of survival and withstanding bad weathers. They are more resilient, and can absorb shocks far better than Layers and Broilers. Poultry Farming is a bit capital intensive - it's all like trading money to make more money. You need to prepare for this especially if you wants to start on a higher scale. But be assured of making back whatever amount of money you invested in the business in multiple fold within a short period of time. Before you venture into poultry farming business, you need to seat back and do proper calculation and planning; make sure you have idea of all the costs involved. Currently there seems to be no high level, hi-tech poultry farms in this country like the ones in USA, Europe and Asia. Any investor with the nerve and needed capital to venture into it will have reasons to smile within a short period of investment. Till now, Nigeria still imports chicken from other countries because local farmers cannot meet the demand of the over 170 Million citizens. There is certainly huge market for poultry rearing but the question is: Who will take advantage of the opportunity in the industry. Now - if you're ready to get started here are the basic requirements you need to set up your farm. One plot of land of 120 x 60 square meter is perfect for setting up medium scale poultry farm, at least for a start. Once you have a land that is big enough for your farm set up, half of your need have been taken care of. Land is about the hardest and probably the most expensive part of poultry business in places like Lagos, Abuja, and other major cities. Since you may not be allowed to carry out Poultry farming amongst residents or other populated environment due to the smell that is associated with poultry rearing and the subsequent health impact, I'll advice that you look for land in a rural area or in farms. There you will get lands cheaper, stays out of trouble and do your production there, while your products will be transported to the urban area for sell. You can get a large chunk of land in a developing area for small amount compared to how much you will get the same size of land in cities. It is recommended that you get your own poultry farm land and build a permanent farm rather than to lease to avoid disruption. If you lease a property, the owner may decide to issue you quit notice at the point you should be settling down and making progress in the business. And relocating always comes with huge cost. Except you have much money to invest in poultry farming business in a large scale and operate with the best of technology, city may not be ideal for you due to the smelly nature of poultry farm. If you are in Lagos for example, you can look for land space in nearby ogun state, areas like Ijebu, Imota, mowe, etc. A plot of land in these areas is way cheaper! Chicken Coop or Hen house is the building where your chicken will be kept. This is the second most important part of your poultry farm set up. The sizes and construction varies based on your need but make sure the building is spacious enough for the chicken to run around. The house should be constructed in a way that you will be able to control the ventilation and air movement. Get a qualified engineer to do designing and building for you if you are going for large scale construction. Else, you can just visit any good poultry farm to see how the house is constructed. 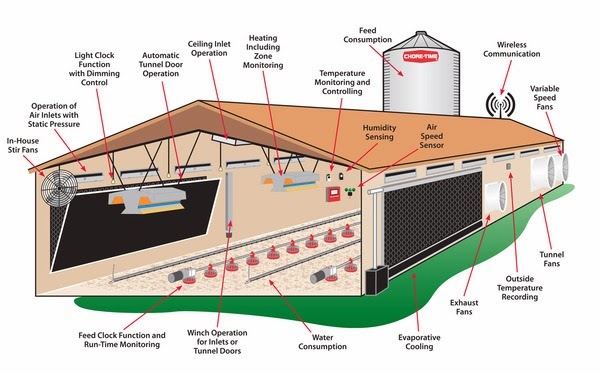 The diagram below is the typical design of the standard chicken house. Like I said before, visit Poultry farms to see how it is done in your area. When planning out your Hens house, always remember that space is very important. Don't compromise on this to avoid frequent loss of your birds through suffocation and contamination. You need to acquire your birds (normally day-old chicks) and will have to take very good care of them for the first seven to nine weeks of their life. You must buy your day-old-chicks from a healthy source -- the productivity of your chicks depends on how healthy they are! Buy from chicken hatchery that mainly deals with the supplying of different species of day-old chickens. It's better to buy from the hatchery, Chicken hatchery usually produce good quantity of day old chicks through the use of incubators. The estimated price for day old chicken in Nigeria is N150 - N250. Negotiate the prices with the sellers, you can get it cheaper if you're buying from 500 chicks. Drop your address and phone number below in the comment box if you are day-old-chicken supplier in Nigeria so that people who needs it may patronize you. You may drop your site address if you have. Please, do not pay anyone money until you see the chickens 419ers are everywhere trying to take advantage of people who have the money. Be wise with your money and pay only when the goods is supplied! So if you are to start with 500 birds for instance, you will need about N2 million. This will buy you a piece of land which is quite expensive. And you must ensure that you have enough space for the chickens to run around; then you put up structures because chickens need shelter from the rain and predators. Chicken feed is very important if you want good harvest. You can buy feeds at stores and make sure you buy the sack of feed that bears the label for the kind of chickens you have, such as Broiler starter, Chick starter, Layer feeds, etc. 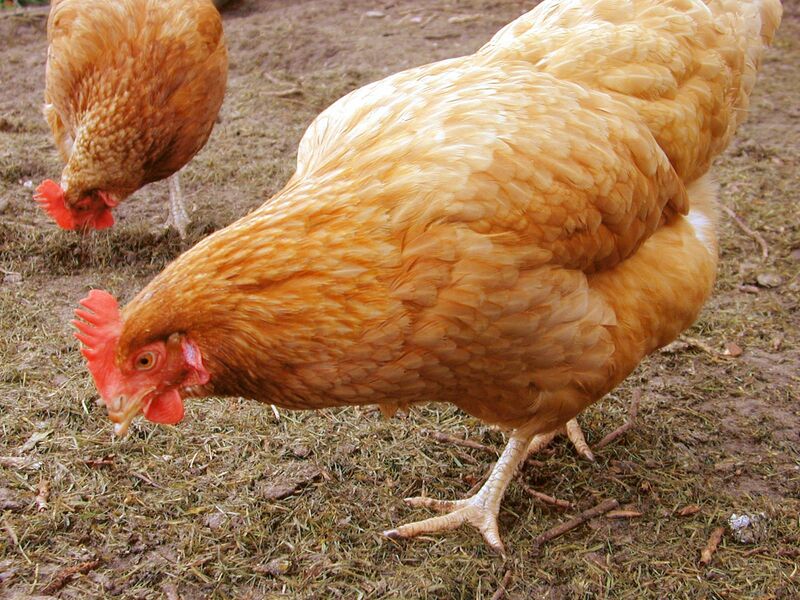 The store feeds are basically balanced feed which will help your chickens do fine if you don't feed them other feeds. Avoid cheap feeds that have low nutritional value -- your bird wouldn't do well with that, don't just buy because they are cheap, buy because the feed is quality and contains good nutritional value. You can also set out whole grains in a separate feeder if you like. I do. This can save you a lot of money if you have a source of cheap grain, especially if you use a high-protein chicken feed. For example, a high-protein layer ration with 20% protein will be formulated for use with supplemental grain, with the assumption that the hens will eat about 50% layer ration and 50% grain. Chicks need lots of protein and will pretty much ignore supplemental grain until they're older and aren't growing as fast. There's really little point in offering them grain until they're 6-8 weeks old. Apart from the feeding, you need to regularly vaccinate your chickens to protect them from bird flu and other diseases. Feeding is extensive, you have to feed them from day-old to maturity. Important: Light must be available at all time in your poultry farm to keep the chickens warm, especially during raining season when the humidity is always very low. Look for reliable source of power to supply your poultry house with heat and light. Most layers will start laying eggs the moment they are 18 weeks old but some wait till they are about 22 weeks old. Whichever way, Layers farming is considered the most lucrative of all poultry farming. This is because Layers do two things, they lay eggs which fetch good money in the market, and are equally sold for the meat as spent layers. A full crate of eggs sells for about N800. If your Layers are large enough to produce 10,000 crates of large eggs which sells for N800, you will be making at least N800 X 10,000 = N8,000,000 From eggs alone! The chickens itself is another ball game! A fully grown chicken sells for between N2,000 and N2,500 (N1,500 to N2,000 at wholesale price) depending on the size and maturity level. Therefore, ten thousand chickens will give you N1,500 x 10,000 = N15,000,000! Thank man God bless you This is a way out poverty you have shared here. Bill gate advised many poor family in Africa to do just that I am following suit.